Hand dyed luxury knitting yarns in 4ply and lace weights using exotic fibres such as Alpaca, Yak, Silk, Cashmere and Camel, as well as Bluefaced Leicester and Merino. Our own blend of Alpaca Silk Cashmere tops for hand spinning in 5 natural colours and well as hand dyed. We are adding custom blends to our range of fibres and our latest is Merino Silk Yak which is proving popular in both dark and light versions. 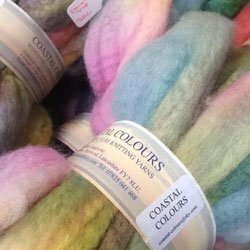 We also have hand dyed tops using various wool and exotic fibre mixes Also available are knitting patterns, knitting needles, kits and handmade wooden lucets and buttons.